A group of Japanese researchers led by the Osaka University has developed a prototype construction robot for disaster relief situations. 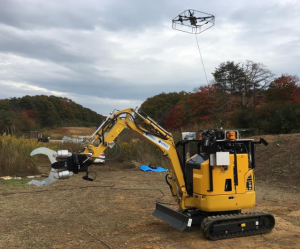 Part of the Impulsing Paradigm Challenge through Disruptive Technologies Program (ImPACT)’s Tough Robotics Challenge Program, the researchers comprising of Osaka University, Kobe University, Tohoku University, The University of Tokyo, and Tokyo Institute of Technology, built the disaster relief robot in order to solve various challenges of conventional construction machines used in such situations. ・Quickly and stably controlling heavy power machines with high inertia by achieving target values regarding location and speed through fine tuning and by controlling pressures on a cylinder at high speeds. ・Estimating external load of multiple degree of freedom (DOF) hydraulically-driven robot from oil pressure of each hydraulic cylinder. The estimated force will be used for force control or force feedback to the operator of tele-operated rescue robots. ・Measuring high frequency vibration by a force sensor installed at the forearm of the robot and giving the operator vibrotactile feedback. ・Flying a multi-rotor unmanned aircraft vehicle UAV drone to the place of the operator’s choice and obtaining image information. Long flights and pin-point landing of the drone are available due to power supply through electric lines and a power-feeding helipad for tethering the drone. ・Presenting the operator images of an overhead view from an arbitrary place by using 4 fish-eye cameras mounted on the robot in real time so that the operator can assess the area surrounding the robot. ・Using a far-infrared ray camera capable of viewing with long-wavelength light so that the operator can operate the robot while assessing the situation even under bad weather conditions like fog.